Rated 5 out of 5 by djrum525 from Absolutely loved this game! Based on entire game and bonus. I had a blast playing this game! The storyline was excellent and I enjoyed hanging out with the main character. He echoed things I would've thought myself when dealing with the paranormal. Not that I deal with the paranormal but you know what I mean! The story progressed nicely, the hidden object scenes and puzzles were very good. Overall, a very well put-together game! Rated 5 out of 5 by fh2901 from Gripping tale and challenging game play So good to see a storyline and game that grips you from the start, and makes you jump, but without being so full-on that it detracts from the game play. Lots of extras to look out for in the CE too. Rated 5 out of 5 by NoDot from A fresh change of pace. This has quickly become one of my favorites. I really enjoyed the storyline, it kept me captivated. The puzzles are just complex enough. The main character is loveable and the voice acting is fantastic. It is nearly a perfect game, only nearly because it had to end. I cannot wait until the next one drops. I enjoyed this game immensely. I have been a member since 2014. Rated 5 out of 5 by Sketch1943 from Great Fun I very much enjoyed this game and cannot wait for the next one. I wish it was a little longer but the storyline was awesome and I think this will be a great new series if that is what Elephant Games has planned. Keep up the good work. Rated 5 out of 5 by Kay_Erin from Creepy Light An excellent mystery game from one of my favorite devs. Morph and collectible in every scene. Plot is pretty standard, but the attitude that “Detective Rick” who has a helpful attitude and is full of wisecracking quips, (as opposed to so many who go into shock, angst or whatever when they find paranormal events that they actually went looking for) adds a humorous tone which I really like and led to the title of this review: "Creepy Light". The villain is pretty obvious from the get go, and she is truly an evil one. Poor ravens again get snagged for the job of evil rep. The light tone and quickly moving game makes it seem shorter than it actually is. The h/o & morphs in each scene are represented by a little chalice on the map. As Penmom say,s it helps to study the scene and find the collectibles BEFORE scanning the mouse over the scene, as sometimes you will accidentally pass over them and the hand gives it away. (I do wish they had an option to use or not use the “clue hands” like they do if you don't want sparkles in a HOS. The sequel involves his first “case” and is well done as well, with a connected story, but a totally new case. This very likable game is Totally worth a CE price. I highly recommend this Elephant game! I'm looking forward to more in this series:) PS I especially enjoyed the pachyderm puzzle with Elephant tooting it's own horn (or trunk maybe)! 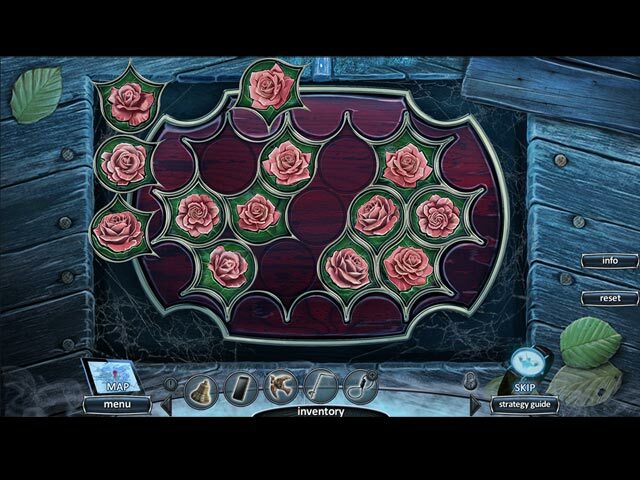 Rated 5 out of 5 by LavenderLuna3 from Great Hidden Object game I really enjoyed this game. Enough of a challenge to be interesting without being mind-boggling. I usually go for the adventure games and this one was more of a hidden object game but the quality of the artwork and background music kept me interested and curious. I recommend this game. Rated 5 out of 5 by timothya from Great New Series Another five-star review, and this one earned it. Yes, the hitchhiker trope isn't new, but this one is an excellent version with a very nice mystery wrapped around it. And, a bonus game worthy of the name. Pros: nicely rendered graphics, cut scenes to the point and not overdone. Excellent voice acting - the Hitchhiker in particular manages to convey a hint of exasperation at her fate. Player character is a male POV with the ladies getting most of the action for a change, and that voice actor conveys a hint of innocence as well as heroism. Well done! Outstanding puzzles, some probably a bit too difficult for beginners. Cons: none. Writing: a strength. This one turns into a murder mystery with a couple of nice twists, and the full measure of the villain's villainy is revealed slowly and logically. Overall, a great start to a new series. Looking forward to the next installment! Rated 5 out of 5 by theshewolf from Wow...just wow I loves this game from start to finish. Great voice acting, great storyline...just great. Even the bonus chapter was well done with a new, but connected, mystery. This is clearly the start of a new series and I can't wait for the next one! Rated 5 out of 5 by sharpei2 from LOVED IT!!! Its been a long time since I have enjoyed playing a game this much. Creepy but without all the over the top monsters that are in so many of the games these days. Loved the storyline and the way this game flowed. Thank you for restoring my faith that games like these are still being made. Rated 5 out of 5 by conja from When's the next one! I have become a follower of the paranormal! It starts off with you picking up a hitchhiker - at night - when all is dark! Right away I think "creepy". It turns out she's been killed by someone you will soon meet. You make it to the mansion and from then on, you are on the hunt, picking up clues and helping displaced souls along the way. The visual and sound are great and the storyline is clear and keeps you going. Soon into the game, I think "never trust a possessive mamma". You play games within games within games. Just when you think you finished one mini-game you have to do something else. The map works well. Rated 5 out of 5 by hookedonhops from Wonderful Paranormal Hidden Object Game I am glad they have more Paranormal type games. I liked the male character, his voice and sardonic humor. I like male hero's more than female. I can hardly wait for the next game in this series. Thanks to the creators! Rated 5 out of 5 by Libra2010 from I loved this game!!!! Worth every penny! I loved this game so much! Please please make a series out of this! The story line was perfectly creepy. However, the story telling is defiantly for adults, and not for children. The mini games were challenging and sometimes even hard. I played this game in one day, which I usually do not do. I was actually bummed when it ended. Perfect game. I cannot wait to play another one in this series!!!!! Rated 5 out of 5 by mccurdynk from My new favorite Hidden Object This is a great new series. Love the puzzles, the storyline, and the graphics. The hidden objects are different and their aren't a bah-zillion of them so you get tired of them after awhile. Also, some of the simple puzzles give you more than one item needed to complete tasks, which is nice. The final puzzle isn't so difficult it takes you forever to get out of the game. Really enjoyed this one and look forward to the next. Rated 5 out of 5 by Majestyx12 from Love the New Series from Elephant Nice and Creepy Mystery. Very well balanced with 13 hops and 13 mini-games that you can replay. Nine hops in the main game and Eight mini-puzzles in the main game. I liked the hops and part of the mini-games. The collectibles- 12 hidden eyes, 12 ravens and 26 morphing objects. I had a glitch on Windows 10 but could continue so bfg is taking it's time getting back to me. Loved the bonus chapter with the creepy bear tied to the Bennett Mansion. 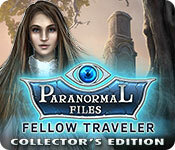 Rated 5 out of 5 by PirateM from Paranormal Files: Fellow Traveler These are the kind of games I love. Mystery and Suspense. The story line could use some work, but all in all I really liked it. Graphics are great and the puzzles are good. There should be an option for male or female characters as I like to play as female. Love it. Rated 5 out of 5 by CourageAngel from Killer Ghost Bride? Learn the Truth on Route 39! The game contains: 5 chapters for the main game, 1 bonus chapter, and 3 different collectibles. It also has the many achievements and the strategy guide that you can expect to see in a CE. I also liked that they added the nice touch of a bit of history for the collectibles that belong to Rick (once you locate the "eyes" hidden in some scenes). We start with by picking up a hitchhiker named Emily. Things soon turn down a dark path as Emily disappears. We soon learn that Emily is a ghost, and that anyone who picks up this phantom hitchhiker will die in 3 days. The curse has taken numerous lives before this, so can you escape with your life while uncovering the truth? To start, I love that Rick mentions the fact that this is how things can go wrong in horror movies when deciding to give Emily a lift, only to say that his mom raised a gentleman. I liked the characters we met along the way, from Emily the Phantom Bride to others like Norman and more. The visuals in this game are amazing! The sound was nice. The story was a bit predictable for me, as I guessed what had occurred long before they admitted it. It didn't take away any of the enjoyment in playing the game. I loved every minute of this game. I do have to mention that there are some errors in spelling. For example, in the bonus chapter, they have a character say "She" but they end up spelling "See" instead. There was also some mistakes, I thought, in the note that Emily's groom wrote her. Honestly, it doesn't take away from the game, as I understood what they mean... but it would have been nice to avoid those little errors. Overall, I really enjoyed this game. It's a great introduction to a new series. I'm looking forward to the next game! Rated 5 out of 5 by dancemom1 from 3 days...only 3 days! Hello friends! As usual, I review mostly on the game play and leave the story to others to tell. I do, however, comment on it now and then. I don't know if this Paranormal is part of a series along with the others...if so, this is #4. Graphics were actually quite good in this one. Very little blurring, but I think most of it was on purpose because of the setting and story line. Game play was excellent, with no problems during the demo. Colors are bright and true, and not over powering at all. Nicely done. Animation is well done, with smooth mouth, eye and body movements. Voices were age and character appropriate, with some emotion and sinister when needed. Music was soothing and unobtrusive. Sound FX are well done and move in and out with whatever is happening at the time. There wasn't a lot of character interaction, but enough to keep you interested and break the monotony. HOPs are very well done, with straight lists, fragments, silhouettes, and finding words. Items are not difficult to find and the scenes are not cluttered. Puzzles were mostly very simple and took no time or brain power to complete. Hint system is helpful and we do have the transport feature for longer locations. This is quite helpful, as we do backtrack quite a lot, mostly to use an inventory item. We do have a jump map, which is nothing special, but it does show you where a collectible is found, or missed. Collectible are many and very well done. Yes, we do have challenge in finding them! We have 12 eye silhouettes that are well blended into the background and not easy to spot. These are not in every scene, so remember to look for them. We also have raven silhouettes/pictures/statues that seem to be large enough to see, but easy to over look. Yep, there are morphing items as well. These seem to morph in such a way that if you don't look right at it, you can miss it. Of course, if you just can't find these collectibles on your own, they are listed clearly in the Strategy Guide. This story is nothing new, but it is well done and easy to follow. Even though I think I know what's happening, I have the need to play this one out and see where it goes. I think all levels of players will find this one fun and challenging, and I feel this one is worth the price of a CE. Yes, I am adding this one to my ever growing collection of CE games. I give this one a 4.75 on my scale. As always, try it for yourself and see what you think. We all have different tastes in games and you may not care for this one at all. Thanks for the reviews. Play on! Rated 5 out of 5 by LovetoMissLisa from "BEST GAME IN YEARS!" I have been waiting for this game for months, since I beta tested it. It is one of the best game (IMO) in years. Like the great game of ole days. I highly recommend this game. At the very least, give it the free demo try. Your not wasting your time! WINNER!!!!!!! Rated 5 out of 5 by 1955raven from 3 DAY'S TILL DEATH !!! UNCOVER THE TRUTH BEFORE IT'S TO LATE! IN THIS GREAT NEW SERIES! A LOVELY HITCH HIKER , BRINGS YOU TO A HAUNTING MANISON WHERE YOU ENCOUNTER A CREEPY CARETAKER, AN ELDERY WOMAN, AND YOUNG MAN. ALL WITH A STORY TO TELL! ELEPHANT HAS YET AGAIN CREATED A GREAT GAME! Rated 5 out of 5 by mmdgaston from creepy good my only problem with this game , too short. this will be a great series.........good job ELEPHANT GAMES!!!!!!!! the graphics were wonderful, puzzles were easy. i will let others go into great detail. great game.......have fun gamers. 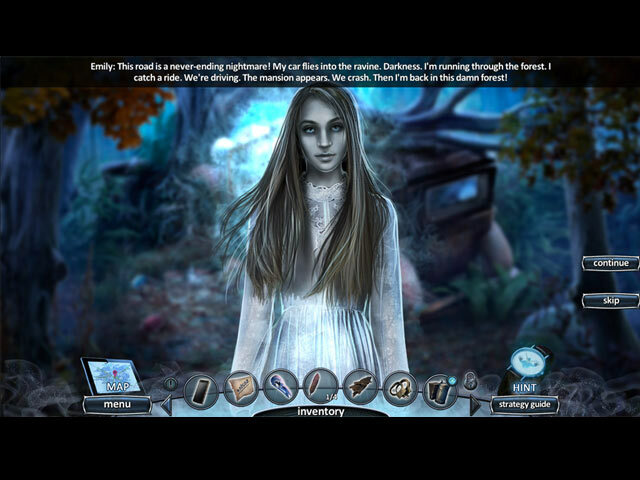 Rated 5 out of 5 by biscuitsmama from A PRETTY FACE DOESN'T ALWAYS SHOW THE FULL PICTURE In what I am hoping is the kickoff bid in a new series Paranormal Files, this game Fellow Traveler is excellent. If more than 5-stars were available this game would get them. Rick Rogers is on his way to nowhere in particular when he stops to pick up a woman who is wandering in the woods. Rick finds himself on Hwy 39 when he happens to meet Emily a beautiful young woman who needs a ride to a mansion that is not that far out of his way. Rick’s life has recently had more downs than ups after he loses his job and even worse, goes home to find his fiancé in bed with his best friend. So maybe helping a beautiful woman won’t be that bad after all. It is obvious that Rick’s judgment is not firing on all cylinders when he meets Emily and soon he will live (or die) to regret his lapse. It is not long before Rick begins to see just how wrong he was! Wow, this is one great game! After feeling rather blasé about the slew of recent cookie-cutters that have come our way, Fellow Traveler has a storyline that held me from the first scene through the bonus game. Trust me this doesn’t often happen as I am generally done by the time I reach “the end”. From the minute that Rick picks up Emily on the road this game leads me down the path to an excellent game that provided hours of entertainment. The HOPS include enough variety that I didn’t become bored. The graphics were clear and it made playing through the HOPS fun rather than tedious, without that “oh no, another HO scene” feeling. Not only do we find the traditional scenes but there were many mini-scenes thrown in as well. Recently, I have played several games where the “mini-HOP” was used frequently and it looks like this is a new trend that we will see more often. The puzzles were entertaining and some even had enough challenge that I needed to use the old grey matter to solve them. There is a good balance between puzzles and HOPS in the game but the scale tipped a bit more in favor of the puzzles. In the end, I was left with a very positive feeling about this game and know this is a game that I will definitely play again. As I played, I had the feeling that .Paranormal Files is a new take on the long-time Haunted Hotel series and maybe that series will finally be put to rest. After playing the beta for the game, I knew this game would be a keeper, and it definitely is! Even though this game is one that I love, as always, please try the demo to see if Paranormal Files Fellow Traveler is a game you will enjoy. Happy gaming! Rated 5 out of 5 by MaryCricket from Never Pick up a Hitch Hiker - you'll be sorry if you do Once I saw the game I bought it right away because I love the paranormal, I love the music, the scenery, there are 3 types of collectibles, morphing, ravens and collectibles. I found this game not that scary, because I watch Paranormal TV every once in awhile and that is why I bought the game. And in this story. There are always a reason why ghosts are still around and this one seems to keep repeating herself, she hitches a ride and disappears. three day later. she is a the roadside hitching a ride again, giving the driver 3 days to live. Rated 5 out of 5 by pennmom36 from NOBODY DOES CREEPY BETTER THAN THIS PACHYDERM! Rick Rogers was determined to make a fresh start after a rocky relationship and betrayal from his best friend. Everything he owned was packed into his car, and the road home seemed unusually long. Route 39 was a lonely stretch of highway, there wasn't a soul in sight for miles, until a hitchhiker appeared around the bend. Rick knew better than to pick up a stranger, but after all, they were in the middle of nowhere, and she was quite beautiful, what could possibly go wrong? Everything goes wrong! Rick should have kept driving that fateful day because now his time is limited, just 3 days, Rick has been given a mere three days to live, or 3 days to survive! Welcome back Elephant! Just a few weeks ago I was writing about how disappointed I was that this dev had seemingly abandoned the creepy graphics style that drew me in hook, line, and sinker when I first discovered their popular series with the tiny little Elf dog (can I say the title?) So now I can say once more "NOBODY does creepy, abandoned, paranormal like this dev!" <insert handful of peanuts> This is the kind of plot that keeps you on the edge of your computer seat, one that you can't stop playing because it keeps leading you along with teasers, twists, and turns. Personally, I haven't felt this excited about playing a game after the demo in a long, long time because they usually fizzle after the climactic demo ending as if they had run out of ideas. <insert more peanuts because they deserve royal treatment> Thank you for providing this Masterpiece! This game deserves an award for its genius storyline! <so here's more peanuts> In this Collector's Edition version there are Hidden Eyes or Hidden Ravens in each scene and each scene has a Morphing Object. My only complaint is that the cursor turns to a hand when it scans across an item, but I worked around that by not moving my mouse until I found the collectibles. 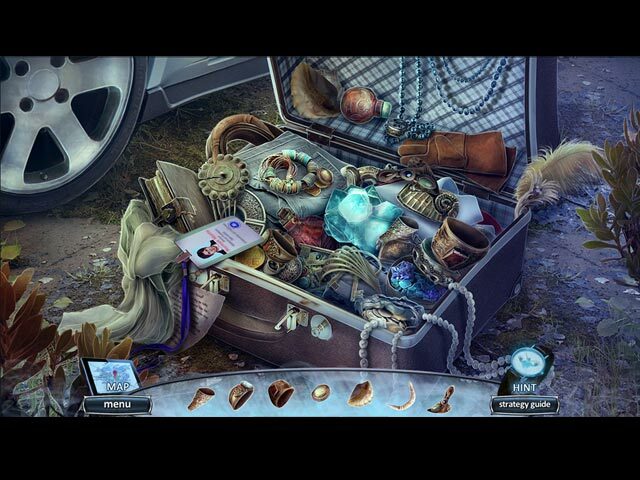 The Hidden Object Scenes are varied with Pictured Items, Silhouetted Shape Finds, Keywords in Sentence Finds, Sketches Finds and Multiples of the Same Item Finds. Many of the HOP's are smaller Zoom Zone's, and most are located in interesting scenes. I really liked the HOP where you had to find Sketches on a wooden door that had been partially scratched out, I haven't seen that style done before. The Mini-Games are fairly decent and most are doable on the first attempt. Below are brief descriptions of some of the games you'll encounter during the demo: 1) Choose the correct symbols that spell the Latin word shown. 2) Swap destination stickers to correct country locations then input numbers into the lock. 3) Rotate the wheel to show matching symbols on the walls. 4) Swap picture frames to their dust outlines shapes on the wall. 5) Place torn tapestry fragments using arrows to scroll up and down. 6) Recreate symbols by selecting rotation buttons. 7) Select pairs of ghosts to find matching symbols. This Collector's Edition version has 10 wallpapers, 10 Concept Art pictures, 1 Screensaver, 5 Music Soundtracks, 10 Achievements to earn, 13 re-playable Hidden Object Scenes, 13 re-playable Mini-Games, 12 Hidden Ravens, 12 Hidden Eye (Personal Items: Hunter, Car, Graduation Cap, Caricature, Supernatural Magazine, Rick's Photo, Shooting Trophy, Wedding Ring, Broken Phone, Cufflinks, Coffee Mug, Lighter) 26 Morphing Objects, 5 Main Chapters +Bonus Chapter and a built-in Strategy Guide, enjoy...for 3 days! Rated 5 out of 5 by rainworm from Where does route 39 lead us? Starting like a normal event, we find ourselves in a secluded mansion, where a strange elderly lady won’t let us go without fulfilling certain tasks. In the park in front of the mansion gates we find a lot of abandoned cars, find left items of other young men, apparently having stepped into the same trap. And it seems to a trap. Our hitchhiker has vanished, we have understood, she was not real after all, but we cannot just leave. In the mansion an elderly lady watches our steps. The other unlucky ones have received the same message, we did, after the girl disapeared: You will die in 3 days. In the course of time, we learn, this message is meant, as the period, we have left, gets shorter….. The minds behind the Grim Tales and Haunted Hotel series are telling us a haunting tale with an exciting story, a palette of HOS variations and many puzzles. Fast paced game, you have a lot to do. And you need to have in mind clock, ticking down the days of life you are still granted. Wonderful start in a new series!